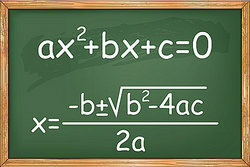 A quadratic equation is an equation of the second degree, meaning it contains at least one term that is squared. The standard form is ax² + bx + c = 0 with a, b, and c being constants, or numerical coefficients, and x is an unknown variable. One absolute rule is that the first constant "a" cannot be a zero. There are many different types of quadratic equations, as these examples show. "Examples of Quadratic Equation." YourDictionary, n.d. Web. 23 April 2019. <https://examples.yourdictionary.com/examples-of-quadratic-equation.html>. A quadratic equation is an equation of the second degree, meaning it contains at least one term that is squared. The standard form is ax² + bx + c = 0 with a, b, and c being constants, or numerical coefficients, and x is an unknown variable. One absolute rule is that the first constant “a” cannot be a zero.